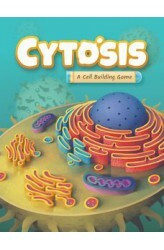 Cytosis: A Cell Building Game is a worker placement game that takes place inside a human cell. Players start out with a number of workers and on a player’s turn, they will place one of their workers in any available location within that cell. Some of the locations provide players with resources (e.g., mRNA, ATP); some with actions (e.g., convert resources, collect cards). Resources are used to build enzymes, hormones and/or receptors, which score Health Points. The player with the most Health Points at the end of the game wins! https://youtu.be/8aabJsCvDaM .. 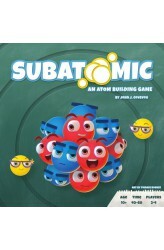 Subatomic: An Atom Building Game is a deck-building game in which players compete to build a number of available elements, which score them points. Each player starts with the same small deck of cards that consist of proton, neutron, and electron cards. They use these cards to build upon their current atom (by playing these cards face-up as subatomic particles) in an attempt to construct one of the available element cards. Alternatively, players may use their hand of cards to purchase more powerful cards for later use (by playing them in combinations of face-down cards as energy and face-up cards as subatomic particles). Subatomic introduces a unique variation on deck-building with a highly accurate chemistry theme, with the ultimate goal of building elements to score..